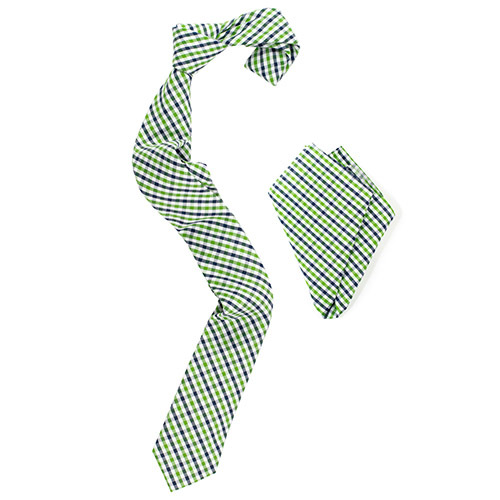 Woven cotton tie and square set in trendy blue, green, and white gingham plaid pattern. Tie - 6 cm (2.4") at tip, 145 cm (57") long in total. Pocket square - 25 x 25 cm (9.8 x 9.8"). 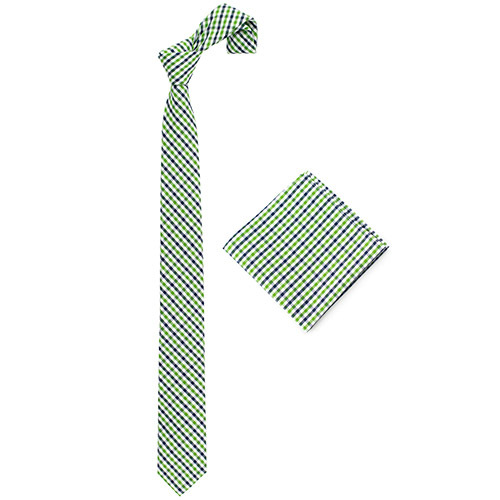 Make a colorful statement in your attire with this gingham tie and pocket square set. Featuring brilliant royal blue, garden green, and traditional white in a vibrant gingham plaid pattern, this men's fashion accessory is both bold and traditional. Made of woven cotton, this trendy tie is suitable for a variety of events - a spring game of croquet, a seaside casual wedding, or a first date with your next darling. Ulterior Motive now offers this tie and pocket square set in a limited edition run. Buy now to set your wardrobe en vogue!